Empress Suiko (推古天皇, Suiko-tennō) (554–628) was the 33rd Emperor of Japan, according to the traditional order of succession. Her reign started in 593 and ended in 628. Historians consider details about the life of Empress Suiko to be possibly legendary, but probable. The name Suiko-tennō was created for her posthumously by later generations. In the history of Japan, Suiko was the first of eight women to be empress. The seven others were: (a) Kōgyoku/Saimei, (b) Jitō, (c) Gemmei, (d) Genshō, (e) Kōken/Shōtoku, (f) Meishō, and (g) Go-Sakuramachi. Suiko was the third daughter of Emperor Kimmei. She was the half-sister of Emperor Yōmei and Emperor Sushun. Suiko was also a wife of Emperor Bidatsu. When Suiko became empress, she ended a power struggle for the throne after the deaths of emperors who were her brothers. 593 : In the 2nd year of Emperor Sushun's reign, he died. The next monarch was his half-sister who became known as Empress Suiko. This succession was confirmed in ceremonies. Prince Shōtoku was the most important man in Suko's court. In 599, an earthquake destroyed buildings in Yamato province which is now known as Nara Prefecture. The reign of this empress was marked by the opening of relations with the Sui court in 600. The use of the Sexegenary cycle calendar (Jikkan Jūnishi) in Japan is credited to Empress Suiko in 604. 604: In the 12 year of Suiko's reign (the Suiko period), Japan organized its earliest Imperial calendar. Suiko ruled for 35 years. She abdicated in 628. Suiko died in 628. This empress' official name after her death (her posthumous name) was regularized only after death. Her reign name means "to reason from antiquity." 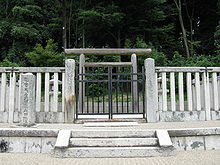 The actual site of Suiko's grave is known. This empress is traditionally venerated at a memorial Shinto shrine (misasagi) at Osaka. The Imperial Household Agency designates this location as Suiko's mausoleum. It is formally named Shinaga no Yamada no misasagi. ↑ Titsingh, Isaac. (1834). Annales des empereurs du Japon, pp. 39-42; Brown, Delmer et al. (1979). Gukanshō, pp. 263-264; Varley, H. Paul. (1980). Jinnō Shōtōki, pp. 126-129; Nussbaum, Louis-Frédéric et al. (2002). "Traditional order of Tennō" in Japan encyclopedia, pp. 962-963. ↑ Titsingh, p. 39; Brown, pp. 263-264; Varley, p. 126-127. ↑ Nussbaum, Louis-Frédéric. (2005). "Jikkan Jūnishi" in Japan Encyclopedia, p. 420. ↑ National Diet Library (NDL), "The Japanese Calendar", "Calendar history/The Source"; NengoCalc, "(596) 推古 Suiko"; online conversion of Japanese dates into their Western equivalents. based on tables from Paul Yachita Tsuchihashi. (1952). Japanese Chronological Tables from 601 to 1872 A. D. (邦暦西暦対照表) and Reinhard Zöllner (2003), Japanische Zeitrechnung; retrieved 2012-11-14. ↑ 11.0 11.1 Nussbaurm, "Suiko Tennō" in Japan Encyclopedia, p. 910. ↑ Aston, William George. (1895), Nihongi, p. 121. This page was last changed on 31 August 2017, at 01:09.